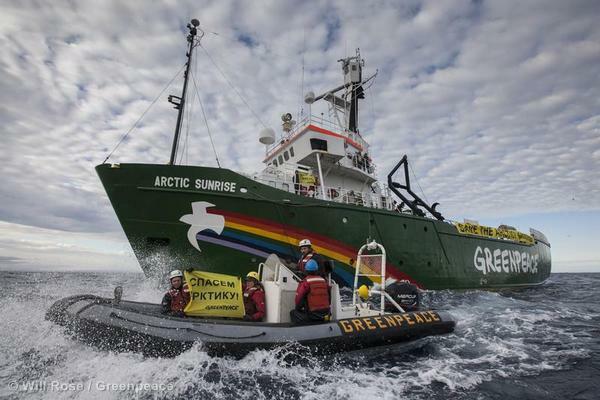 365 days a year, 24 hours a day, Greenpeace ships are at sea somewhere in the world. The Greenpeace ship Arctic Sunrise enters Russia's coastline to protest against Arctic oil drilling. After 22 tireless years at the campaigning, the second Rainbow Warrior retired from her Greenpeace life on August 16th, 2011. 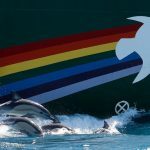 It’s a very proud legacy – and the third Rainbow Warrior, which entered operation on October 14th, 2011, is better equipped to carry it on than any Greenpeace ship before her. The third Rainbow Warrior is the first ship in our fleet designed and built specifically for Greenpeace. She is one of the most environmentally-friendly ships ever made, built of mostly sustainable materials, with huge sails, and a super-efficient diesel engine when the wind isn’t doing it. She comes equipped with a helicopter deck, state-of-the art communications capabilities, and room for 30 crew. Click to read more about the Rainbow Warrior. Ironically, before Greenpeace started using the Arctic Sunrise it was once a sealing vessel. 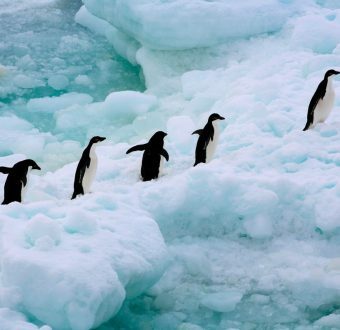 Greenpeace had previously confronted the ship while it was delivering equipment for the French government to build an airstrip through a penguin habitat in the Antarctic to exploit its oil and mineral reserves. The ship’s first contact with Greenpeace was in 1986, in Hobart, Tasmania, when a volunteer scaled the mast, unfurled the Greenpeace flag, and locked himself in the crow’s nest. Since 1996 the Arctic Sunrise, originally designed as an icebreaker, has come within reach of both poles and navigated both the Amazon and Congo rivers. Because she has a rounded, keelless bottom, she is perfectly-suited for icy seas. The Arctic Sunrise was the base of operations for Greenpeace activists known as the Arctic 30, who were detained by Russian authorities for months after they protested a Russian Arctic drilling platform. The Arctic Sunrise was held by the Russian government for nearly a year, but she’s now back where she belongs, peacefully protesting somewhere out there. 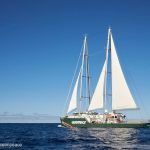 Esperanza (Spanish for “hope”) is the first Greenpeace ship to be named by visitors to our web site. Built in Gdansk, Poland, in 1984 the Esperanza — one of 14 vessels commissioned by the Russian government — was used by the Russian Navy as a fire-fighting ship in Murmansk. At 236.2 feet, with a top speed of 15 knots, Esperanza is ideal for fast and long-range work, such as chasing the Japanese whaling fleet! 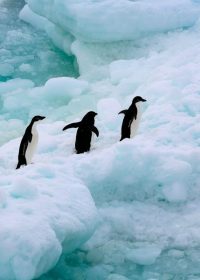 It is equipped with a first-class communications system and its ice-class status makes it suitable for work in the polar regions. After chartering Esperanza in early 2002, Greenpeace spent many months refitting it to the highest possible environmental standards. Esperanza now sails as a proud example of a truly “green” ship! Technically our inflatables are called Rigid Inflatable Boats or RIBs. To our crew who drive them they are just inflatables or to many people ‘Greenpeace in their rubber boats’. The RIB is one of the safest small offshore boats manufactured. Though we refer to them as “inflatables”, they are far more sophisticated than they appear or their name suggest. Though they come in a great variety of sizes and configurations, they all have a few things in common:below the water is a hard fibre glass or aluminium hull that allows the boat to travel at high speeds through rough seas. A specially constructed rubber tube that runs along the bow and sides of the hull gives the boat exceptional buoyancy and stability in the water. A powerful engine makes the boat fast and manoeuvrable. While we have been using them for actions for over 25 years, the inspiration for their use came from unusual source. During the 1972 voyage of the Greenpeace yacht Vega against French nuclear testing, French commandos used inflatables to board the Vega and badly beat the skipper, David McTaggart. The effectiveness of the commando’s boats was not lost on our tactical mastermind at the time, Bob Hunter. If they were effective for the French commandos surely Greenpeace could put them to good use. A couple of years later, in 1975, the inflatables were out to challenge the Soviet whaling fleet and protect the whales from explosive harpoons, as they are still doing 31 years later. Many inflatables have come and gone over the years, had barrels of radioactive waste dropped on them, been squashed by ships transporting illegal timber, impounded by police or just plain worn out. But all the inflatables onboard our ships have names. Some mundanely named after their colour or manufacturer. But some are more imaginatively named. Currently onboard the Esperanza is one nicknamed the African Queen, after the ship which ferried Humphrey Bogart and Kathryn Hepburn up the Congo in the movie of the same name. But probably the most inspiring story is that of the Billy G.
Billy Greene was a promising young filmmaker and animator who was shot and killed in Emeryville, California, on September 9, 2001, during an apparent robbery attempt. Born March 19, 1968, he was well known to have a sunny and generous personality. His art reflected his acute perceptiveness, gentleness, and subtle sense of humour. Billy’s last work, the independently produced short animated film “Thought Bubble,”premiered at the 2001 Sundance Film Festival. It has since been exhibited at film festivals worldwide and continues to win significant awards. He was also a performing musician and puppeteer. 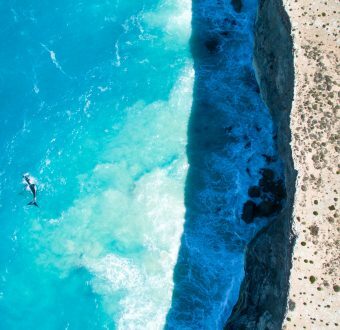 Billy cherished the natural world and took every opportunity to spend time in it: he was a backpacker, a snowboarder, swimmer, and a conscientious bicyclist. He considered the Earth and everything on it with respect and love. He admired Greenpeace’s history of peaceful direct action. After his tragic death, his mother, Robin Davey, wanted to make a donation to Greenpeace in her son’s name. She had her heart set on buying us the best boat we’ve ever had at Greenpeace USA; activists in inflatable boats confronting environmental wrongdoers at sea may be the most recognisable image of Greenpeace around the world. Activists in rigid-hulled inflatable boats (RHIBs) have been chasing commercial whalers, industrial fishing trawlers, ships transporting toxic or radioactive materials, barges loaded with illegally harvested mahogany, and more for decades. Ms. Davey wanted our new RHIB to be outfitted with proper navigation and communications equipment, protect the driver and crew as much as possible, carry any equipment we may need and be built for the toughest of conditions. My colleague Dan, our equipment specialist at Greenpeace USA, set about the task of searching for something suitable. We searched high and low but could not find a boat that would fit our unusual and specific needs, so eventually we decided to design and build our own. Dan worked with an outfit in Wales to design a boat especially for our purposes, designing every aspect of the boat to our specifications. On September 27, 2003, a beautiful Saturday afternoon in Annapolis, Maryland, we officially launched the Billy Greene with members of his family. At 8 meters in length, with the extended range and payload capacities necessary to travel great distances, ability to carry up to 18 people and 100 gallons of fuel, and capacity to store fresh food and dry clothes, it is indeed what Ms. Davey wanted for us. It was clear when we were preparing to sail for the Southern Oceans to confront the whalers that the Billy G would be needed for this campaign. The Arctic Sunrise scooped up the Billy G in Miami on her way to Cape Town after completing Project Thin Ice, a successful journey around most of Greenland to call attention to the threats and realities of global warming and climate change, and brought her to Cape Town, where she was transferred to the Esperanza. During the trip down to where we are now, we worked to fit her with the custom water pump and spray delivery system and special safety equipment that has allowed the boat to be such a successful tool for frustrating the hunter ships.With her powerful engine yet delicate steering system, I’ve been able to hold the boat just off the bow of the hunter at high speeds and in pack ice, aiming the water spray up onto the harpoon deck and spotters’ towers, causing the hunters to lose sight of whales and miss shots. The boat is tough but also amazingly agile in the water. As I said, I never met Hamilton Billy Greene, but every day that I drive the boat I call in a radio check to the Esperanza bridge before we launch: “Esperanza, Esperanza: this is the Billy G, radio check?” and get the quick reply: “Billy Greene, Esperanza: loud and clear”. From there after I am no longer Nathan, I am Billy G. until I’m safely back on deck. 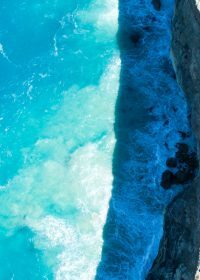 So to me, Billy Greene, the man, is down here with us, guiding this boat safely through these sublime waters and seascapes, foiling these hunter boats and running placing cover for the whales. It’s an honour for me to get to put my hands on her wheel with him. Just to the left of the instruments on the console is a bronze plaque with his name and an etching of him, smiling and looking light and lively. I see it every time I take the helm and bring the boat to life. It’s folks like him and all of you who write us and send us your support, in whatever form you choose, that not only allow us to make the effort we’re making, but also feel like you are here with us. Never underestimate the power of that, and the power you have, wherever you live, to play your own part in this and every struggle we’re making fora better world.